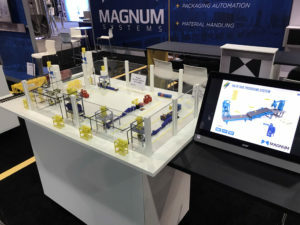 Magnum Systems is set to Exhibit at Pack Expo International. 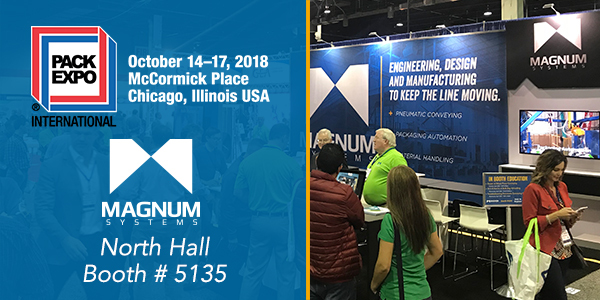 Stop by our booth in the North Hall #5135 to talk with our experts about bulk packaging and pneumatic conveying equipment. We are excited to exhibit at the nation’s largest event for packaging machinery. Magnum Systems engineers, designs and manufactures to keep the line moving. We are your single source for moving dry bulk solids from rail-to-pallet and everywhere in-between. Our experience has been formed through providing pneumatic conveying and packaging equipment to various industries handling the likes of fragile food ingredients to the most abrasive chemicals on the market. Whether it’s one component or an entire system, Magnum Systems combines decades of knowledge and experience with the most contemporary technology in bulk packaging and conveying systems. Customers will be able to interact with our 3D printed replica of a conveying and packaging process. We will also have information packed in-booth education lined up for you! Schedule and links to register are below.